Carlos Noronha Feio's work is engaged with the points at which geography and migration meet, where differing cultures collide, interfere and impose their imperatives on each other. He represents these concerns from the personal perspective of his own Portuguese nationality. 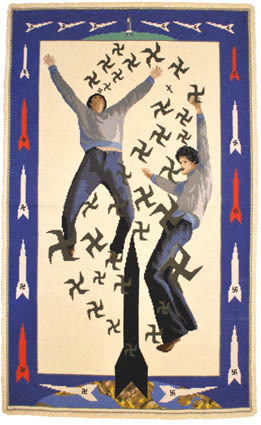 For the project A A and Away Noronha Feio uses imagery from Afghan carpets as a starting point, particularly those depicting the Soviet invasion of Afghanistan in the 1980s. However, Noronha Feio admits that as an 'occidental' he stands outside of this cultural history and therefore he intervenes by creating his own designs inspired by the carpets. 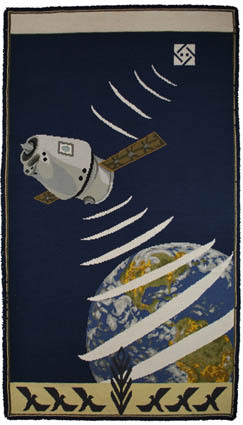 These designs have been made into rugs by traditional carpet makers from the Casa dos Tapetes in Arraiolos, Portugal. A region where rugs have been made for over a millennium and where the influence of the population's Arab roots is still very strong. This concrete cultural interference is symptomatic of Noronha Feio's sincere wish to comment and engage with questions of cultural disassociation. His aim of making a connection of sorts is also evident in his ongoing video performances entitled Simple Movements for a Meaning in which Noronha Feio physically locates himself within different cities. These filmed performances often take the form of Feio imposing himself onto various city landmarks. In Moscow for example he performs a handstand, which becomes a part of a statue to Yuri Gagarin. Noronha Feio is adamant that what is important in his work is sincerity. The work is not laden with political polemic; his is a quiet and thoughtful approach to an increasingly global interrogation. An artistic investigation of what it is to be different. There is a specially commissioned publication available alongside the exhibition.